Volunteer | The Buhay Makulay Children's Project Inc. Thank You, Volunteers! August 23 Children’s Fair, Calauan, Laguna. Your response was incredible! Thank you, dear friends, for taking on the challenge of 1,500 kids with us! Volunteers, we are continuously grateful for your serving and compassionate hearts that allow us to reach children all over the Philippines. If you were in Calauan with us, you may agree that this was one of the craziest Children’s Fairs we’ve ever had. The sheer number of children that were present, the heat of the sun, and the chaos of managing so many activities at once could have been completely overwhelming. But God is faithful and you were patient and loving the whole way through. THANK YOU! We are also certain that you will agree that the children taught us much about hope in the few hours we had together. They shared their dreams, they shared their joys and they shared their smiles with us. 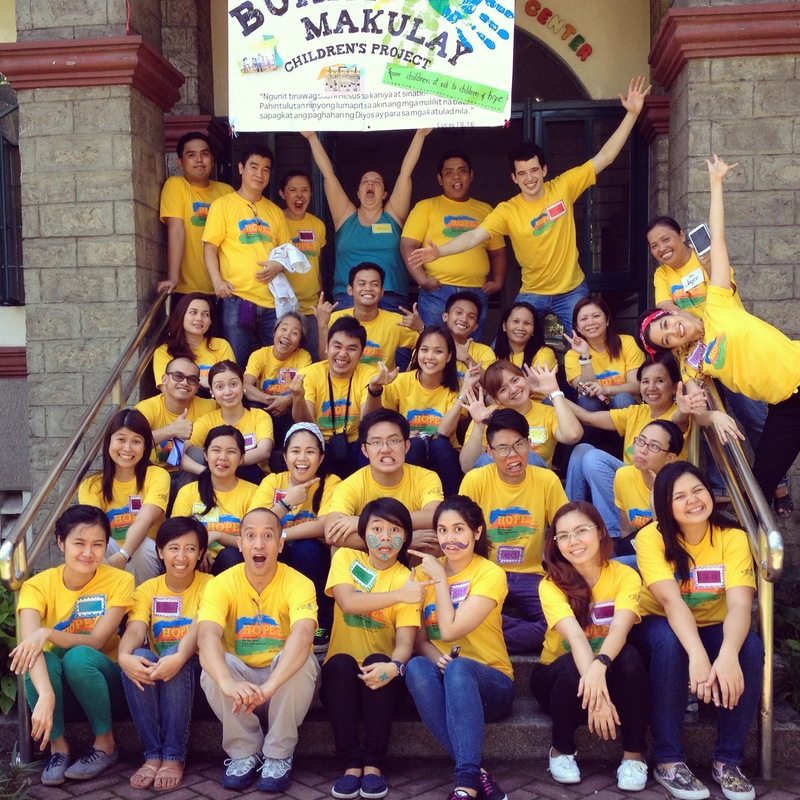 Buhay Makulay was blessed with first-time and returning volunteers from Manila from all walks of life. We also had the help of local youth and young adults from TVET, as well as the blessing of the priests and nuns who live and serve Calauan, Laguna. 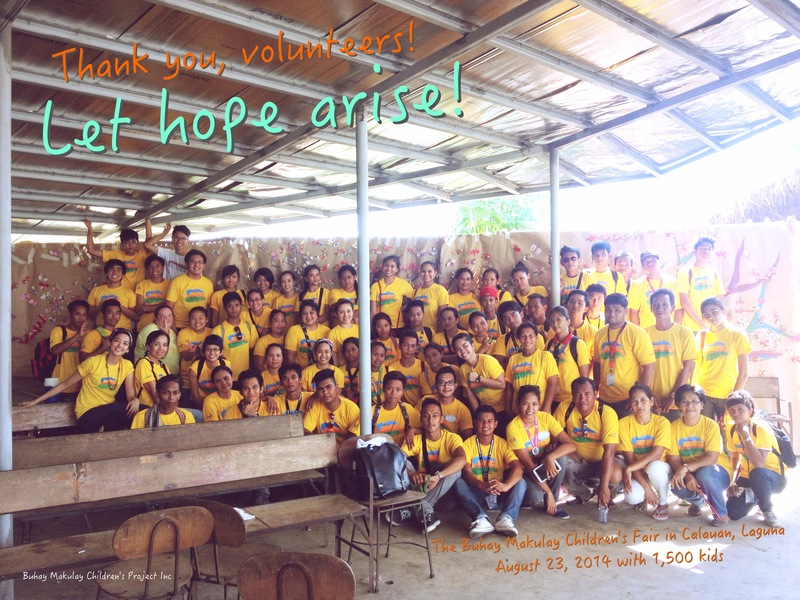 The volunteers are in the photo above – still smiling after a long day of play and love with the children! Help Needed at our Children’s Fair in Laguna for 1,500 Kids! AUGUST 23! Next weekend we will be hosting our 5th Children’s Fair of 2014 and our first adventure in Calauan, Laguna! The community we will be spending time with represent hundreds of families relocated by 2009’s Typhoon Ondoy/Ketsana, and 2013’s Supertyphoon Yolanda/Haiyan. This same community was also hit hard by the recent storm Glenda, which brought damage to their homes, power outtages and food shortage. This is the largest number of children we have ever invited to an activity and we need your help to make this happen! The nuns and priests that have been ministering in this community have a daily feeding program for about 1500 children! There is no shortage of children in the community and we welcome the opportunity to share hope with so many little ones. We need many volunteers for our activity with 1500 children! Volunteers need to be able to commit 5am – 6pm on the day of the event. We will provide transportation to and from Union Church of Manila, in Legaspi Village, Makati. If you are interested, please respond to this email or get in touch with me (Tanya) at 09178274755. All volunteers must confirm attendance by Sunday, August 17th, and will receive volunteer info via email. Children will be receiving a Buhay Makulay tshirt, a box of crayons, a prize or two from some games, and food for the day. All donations will be going toward items such as these that go to the children, and not toward transportation or logistics (unless specified by the donor). Drop off point is Union Church of Manila corner Rada & Legaspi Sts, Makati,, c/o Len Aritao or Buhay Makulay, or make arrangements through 09178274755. Direct deposits may be made to our BPI checking account. Account name: Buhay Makulay Children’s Project Inc.